The Citadel is a publication of the Command and Staff College, Quetta. It provides a forum for the expression of thoughts on doctrinal and conceptual issues and other matters of professional import, or those related to national security and interest. It was instituted in 1984, as an exclusively professional magazine, on the directions of General Muhammad Zia-ul-Haq, the then President of Pakistan and Chief of the Army Staff. The name denotes both the territorial and ideological moorings. Prior to this, articles of such nature were published (regularly since 1947) in the College year-book, known at various times as Owl Pie (1921), The Owl (1922-78) and The Review (1979-83). 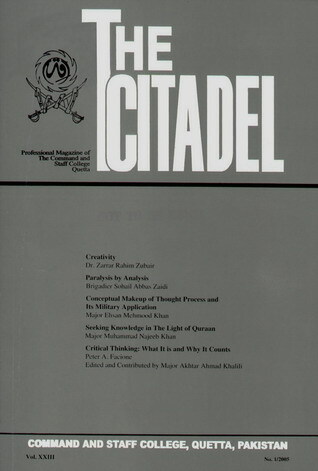 The Citadel is published two times a year - in March and June. Copyright of all material published therein is vested in the Command and Staff College, Quetta. Articles are invited from all officers of the three Services, retired and serving, and from others having special knowledge and interest in military affairs or in matters of national security.